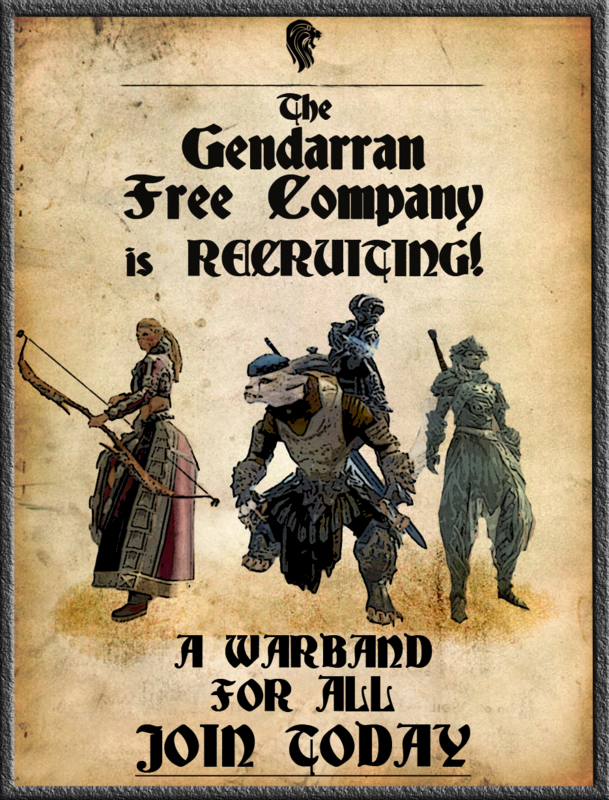 The Gendarran Free Company - Recruitment OPEN! 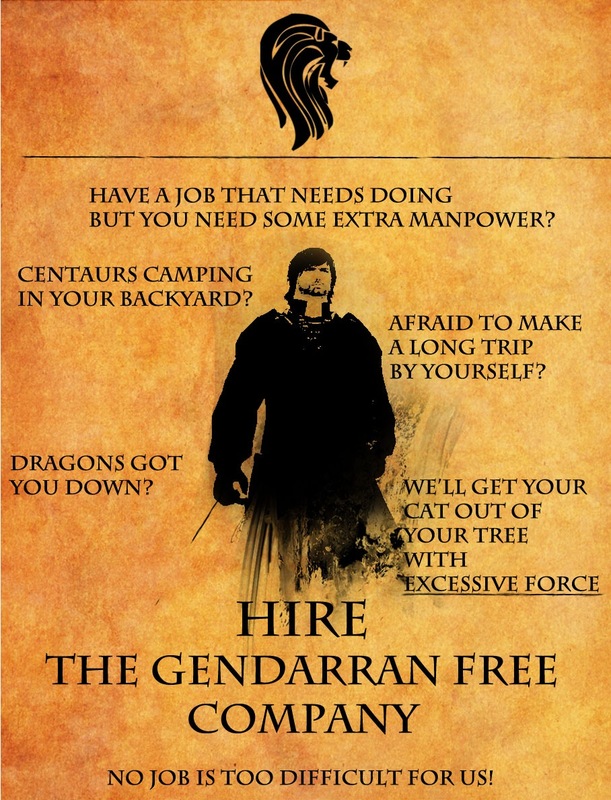 Forums » EU Guild Recruitment » The Gendarran Free Company - Recruitment OPEN! 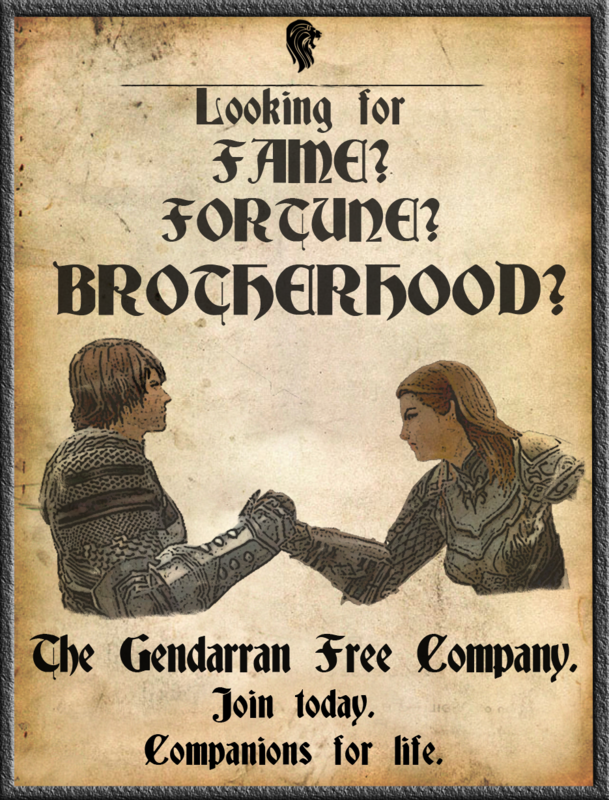 The Gendarran Free Company is a group of tightly knit brothers and sisters in arms who hold no specific allegiance. Funded by benefactors, donations and rewards, the GFC takes on only just causes. From defending farmsteads to breaking castle sieges, Captain Laskaris leads combatants of all backgrounds in a war of their own terms; a truly 'free' company of soldiers beholden only to themselves and each other. Want to see a day in the life of the GFC? Read the story below! The concussion of the blast knocked the kid to her knees, vision blurring as her head swam. The smoke-filled cavern still hadn't come back into focus as she felt herself being dragged to her feet by the scruff of her neck, her hand barely keeping its tenuous grip on her shortsword. "Keep moving, new girl - we've got them on the ropes," the now-familiar voice of the Captain called over the thunderous din as she let the girl's legs find their balance on the shuddering earth. The kid stumbled again, but kept her footing, grip on her blade strengthening as she slammed her back against a nearby boulder for cover. More shells impacted the ground near where she'd stood, exploding in showers of shrapnel which plinked against the rock behind her. Her heart skipped a fear-filled beat as a whirlwind of shadows appeared next to her, which coalesced into a blonde girl with a toothy grin and a ponytail. She held a revolver, smoke trailing from its muzzle, and took a knee even as she materialised, beginning to reload, methodically. "Cap's right, we've got this - just keep it together," the blonde said with a half-laugh, before looking up at the kid with a wink. She slammed the spinning cylinder home, wrenched back the hammer, and disappeared in the same fashion she'd arrived. The kid braved a look around the boulder, trying to make sense of the carnage nearby. The cavern must've been a hundred yards across, and about half that high. The fire at the north end still raged, where the Company's sorcerers had detonated the dredge powder magazine to kick off the battle, and the smoke clawed at her throat. There was a melee in the centre, a pair of huge, bearded norn whose names she couldn't recall rending through a hastily assembled line of moletariat soldiers, bellowing the vengeance of the Spirits as they went. The sorcerers were now trading fire - literally, in one case - with a large, mechanical monstrosity which looked to be half-mole, half-tank. She half-caught a glimpse of the blonde girl, reappearing behind one of the dredge flanked by the norn and ending its troubles with a bullet to the back of the skull. Looking up to a nearby ledge, she saw the Captain, loosing arrows into the melee, while a pale-skinned, red-haired woman she recognised as the Company's healer knelt at her side, performing some sort of ritual. The red-head trailed a dagger down her own arm, and the kid was certain she saw the drops of blood explode into motes of green flame as they fell. The kid found herself charging out of cover, shortsword in one hand, buckler in the other. Time seemed to slow as she raced towards the ledge. A dredge sniper drew a bead on her, though she never knew it. Never saw the glint of gunmetal as it tracked her mop of sweat- and blood-matted hair. 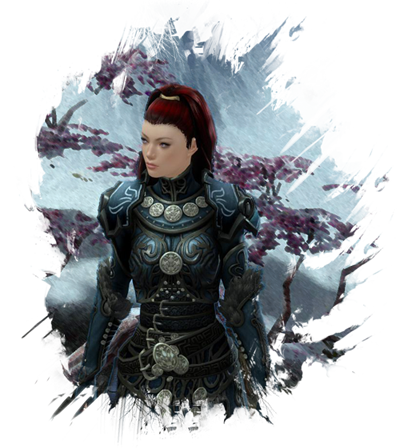 And never saw the dredge's skull evaporate, as the soft-spoken charr perched on the far side of the cavern loosed a rifle-shot to cover her. Her blade sank into the thigh of the nearest soldier of the moletariat with a textbook lunge, the creature tumbling from the rockface with a surprised, agonised squeal. That sound alerted the Captain, who hissed an imaginative curse, whipping around to loose an arrow into the second dredge as it flung itself over the ledge and onto the platform. Its head snapped back, and it tumbled to the ground, landing next to the kid even as her blade ended its fellow's cries. And then, there was a- Almost like an inversion of sound, the air-pressure changing. The red-head's gaze snapped up, and the Captain wheeled around, yelling some barely intelligible command. The kid turned, looking towards the dredge machine, which was now engaged in melee with the norn. As she watched, motes of that green flame began to ripple across the metallic surface, flowing into and around the monstrous device. The kid groaned. She was on her back. How had-? She blinked her eyes open, dust stinging them and eliciting tears which blurred her vision. A vaguely human shape sat on its haunches beside her, and slowly turned into the Captain as her eyes stopped swimming. The tanned, Krytan woman held out a hand to the kid, offering to help her up. "Nice work, new girl - earned your pay today. C'mon, let's get home." The kid felt herself dragged to her feet, for the second time today. She dusted herself down with her free hand, only barely noticing that it came away bloody from her flank. As she turned to look at the others, the Captain releasing her grip, the kid saw that the Companions were already beginning to move out. The norn were laden down with bounty, and the pale-skinned healer tended one of the sorceresses as they walked, laughing about some private joke or other. The blonde girl hovered around another of the magic users, hands clasped behind her back as she skipped near him. Her voice carried, a sing-song lilt audible in every word. "Well, they won't be mole-esting the locals any more!" "All I'm saying is that someone needs to tell the dredge that when you're in a hole, you stop digging." "Stop," said the sorcerer, long-suffering amusement creeping into his tone as they wandered into the distance. And then the kid's gaze fell back to the Captain, still waiting for her, and gesturing to follow. "So," said the Captain, "You coming?" The GFC has aspirations in all aspects of the game; from casual RP in taverns, escorting caravans across Tyria and fighting the good fight on the battlefield. The nature of the guild means that we have free reign to join and create RP of our choosing without stepping on the toes of existing lore - and we take advantage of this to arrange a wide variety of RP for our members as well as promoting independent ideas and initiatives. We don't want to restrict you from enjoying GW2's amazing world but rather encourage you to explore it all as part of our guild. The guild's structured with this in mind, so we won't force you to wear a uniform; we won't force you to attend an RP event or do something on pain of expulsion: you're free to RP when and wherever you like. All we ask is that you contribute to the whole in some way and that you're fairly active, at least every few days most of the time. At the end of every other month a guild meeting is held where anyone promoted beyond the trial rank can vote on directions, or hold their own vote; most things are decided by committee, IC and OOC. Interesting characters. Vibrant, off-the-wall characters, even if they're a bit silly, are much more likely going to be considered over cookie cutter military characters out for revenge because charr killed their parents. For the guild's IC banter to be interesting it's essential that characters are at least somewhat talkative, have interesting character development, and are just fun to be around. Furthermore, we need players that can create their own RP. We don't serve up RP on a plate in GFC; I'm not getting paid enough. 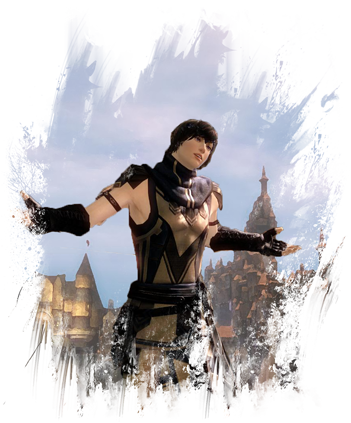 Our community is friendly and always willing to join in, so it's an ideal environment for people who don't mind getting their own RP started; plotlines, events, IC dungeons, or what have you. If you're looking to join, you have to be prepared to contribute. You have to be active. If you aren't representing our guild most of the time, and if you aren't at least active several days a week, you won't get anything out of this guild. It isn't suited for multi-guilding. Be prepared to put effort in, and you'll get plenty out of the guild in return! 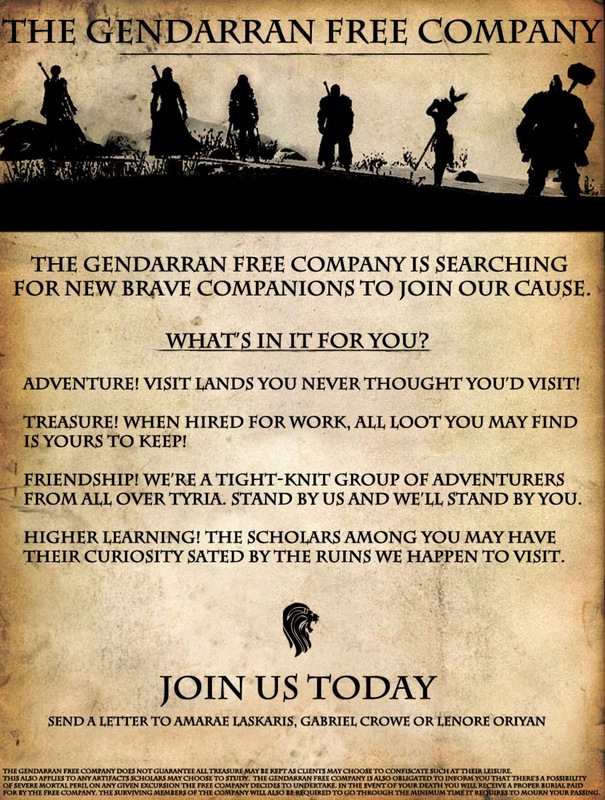 If you're looking to join the Companions, Applications are accepted via our guild website. Please put as much effort and detail into this application as you can, as this is our first impression of you. You can apply even if recruitment is presently closed, and we'll consider it when we re-open. Please allow around a week for consideration - each officer in the guild has to review it before we proceed. A one month trial in the guild. After which, the GFC will vote on approving a promotion to Companion. See below for the Free Company's recruitment posters you might see around towns and cities! The Free Company is always up for hire! If you want to hire the Company for any reason, from guard duties to epic campaigns, please contact any of the officers listed below or seek us out IC. We pride ourselves on a respectful and professional approach on an OOC level whenever we are involved in an event, and we will do our best to co-ordinate with you to ensure fun for everyone involved. Our lovely guild officers are always happy to chat with you if you have questions! You can PM us over Enjin, whisper us ingame or even find us for RP and ask in-character. When we're not busy on jobs, the GFC can typically found around the taverns in Divinity's reach. You're always welcome to come RP with us! I suppose given that I'm clearly stated as an officer of the guild, writing a post about how impressed with the concept I am and how I think everyone should join would be rather insincere. I still do, though. I'm just not going to do it. I am in this guild. Join me. I write long posts. 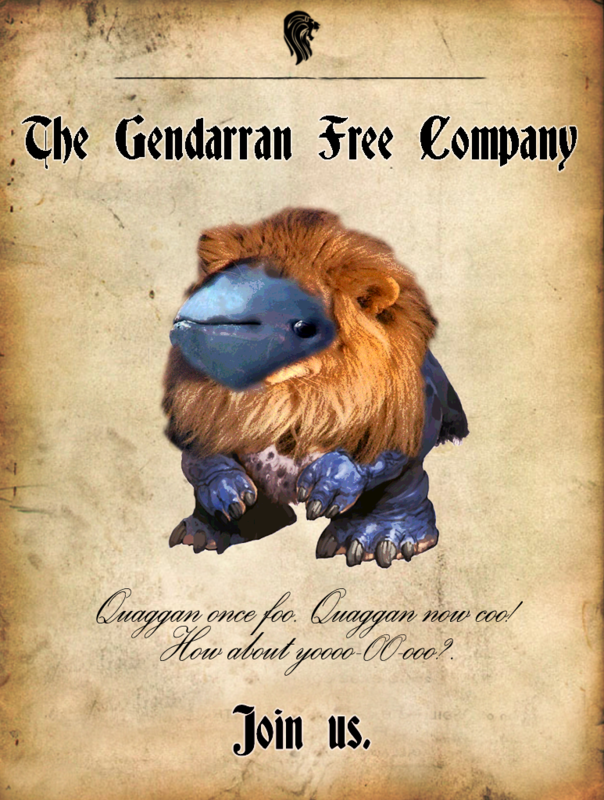 The Gendarran Free Company - That guild we took so long to name. The Tyrian War Council Thread. - Uniting the player base, one squabbling guild at a time. 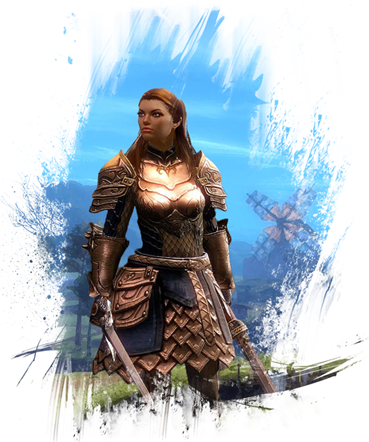 I'm in this guild, looking forward to exploring Tyria and meeting a wide range of great new characters with which to forge lasting friendships or bitter rivalries with. Fresh starts are always good! Whelp. I suppose I better support this terrible, terrible guild. But because I am part of this band of merry men, and women, I cannot do anything else then approve it. Great guild leader and great officers who never give up when trouble hits. I greatly look forward to continuing playing with these people. And Ililsa smells of stinking bishop cheese. Eew. But seriously, I am going to join this when I finally decide what I'm going to play. I'll throw a bump in because tis my duty to ensure this topic remains active, HUZZAH!